We have three liquid filling lines to meet all or your contract filling requirements, large or small. 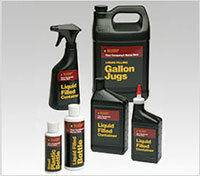 These lines are capable of filling containers ranging in size from 1oz to 1gal. We have gravity-fed and pressure-fed filling systems, designed to handle a wide range of viscosities. Each liquid filling line is equipped with twelve heads for maximum speed and output. To ensure that no leaking occurs in the field, each of our liquid fillers are equipped with induction sealers and not one, but two cap torquers. Full wrap, front & back, and lid labeling are all done in-line. Other value added services include ink-jet coding which contributes to product identification and traceability, and shrink sleeving which can be used for tamper evidence.